In Part I of this series, we explored Grinold’s Fundamental Law of Active Management, and why the theory leads to misguided conclusions in the presence of asset correlations. In this article we will offer a primer on a useful tool for portfolio evaluation, Principal Component Analysis (PCA), and illustrate how PCA can help quantify the number of independent bets in a portfolio of correlated assets. Principal Component Analysis (PCA) is a technique for extracting the endogenous, or latent, dynamics that exist in a system. For our purpose, we will be performing PCA on investment universes to determine the independent drivers of portfolio variance. These latent drivers – or factors – are not readily identifiable like, for example, the Fama-French factors (Fama and French, 1993), but are rather embedded in the universe itself. As a result, this method contrasts with typical regression techniques, such as Returns Based Style Analysis or Fama-French factor regressions, which impose external factor structure on a universe of assets to explain portfolio variance. Principal Component Analysis may be performed on a correlation matrix or a covariance matrix. The covariance matrix contains information about assets’ risk, and the direction of this risk, while the correlation matrix contains only information about the direction of risk. For this series of articles, we will focus primarily on the correlation matrix. That’s because in the context of portfolios, correlation is the only truly independent variable, which can not be altered by the portfolio manager. In contrast, a portfolio manager has the ability to scale the risk of an asset up or down by introducing cash or leverage. Please see the appendix at the bottom of this article to learn why this is so. Principal Component Analysis involves transforming the original correlation matrix to derive factor loadings and eigenvalues. The loadings are in the form of a matrix with the same dimensions as the original correlation matrix. For example, if there were 30 rows and 30 columns in the original correlation matrix, the loadings matrix will also have 30 rows and 30 columns. Each column of the loadings matrix represents a latent factor that explains a portion of the movement of the underlying portfolio. Each row of the loadings matrix corresponds to an asset contained in the original investment universe. Where an asset intersects a column we observe the sensitivity – or ‘loading’ – of that asset on a particular factor. By design, each factor is independent of the other factors, which means they have zero correlation with each other. When Principal Component Analysis is applied to portfolio analysis, columns in the loadings matrix are referred to as ‘principal portfolios’ because they are composed of long or short positions in the constituent assets. 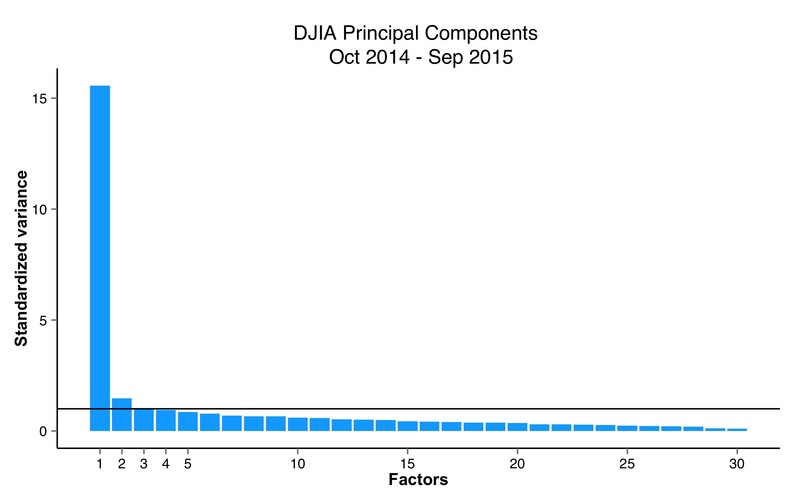 In this way, the factor loadings can be interpreted as asset ‘weights’ in that factor’s ‘principal portfolio’. The returns from these principal portfolios can be observed by applying the weight vector to the asset returns, and, because they are independent, the returns to each principal portfolio will have a correlation of exactly 0 to one another. We can ‘project’ the returns for principal portfolios back through time just as we can for any other type of portfolio. Each principal portfolio has a corresponding eigenvalue, which describes the proportion of total portfolio standardized variance attributable to that factor. When the correlation matrix is used in the analysis, the sum of standardized variances is equal to the number of variables or assets in the universe under analysis; when the covariance matrix is used the eigenvalues sum to the total portfolio variance. Figure 1. plots the eigenvalues, or standardized variances, derived from a Principal Component Analysis of the correlation matrix formed from the 30 stocks in the Dow Jones over the 252 days from October 1, 2014 through September 30, 2015. Figure 2. shows the principal portfolios of constituent stocks, which load positively or negatively on each factor. In examining the standardized variances in Figure 1, we note that the first factor (Component 1) exerts a disproportionate impact on the Dow Jones 30 stock portfolio. In fact, it is responsible for about the variance of the next most explanatory factor, and for about 45% of total portfolio variance. Generally, in the case of an equity-dominated universe, the factor that captures the most portfolio variance is considered to be market ‘beta’, and quantifies the degree to which the movement of the average stock is related to the movement of the market as a whole. This is validated by the observation that every stock in the Dow loads in the same direction on Component 1. Other factors might capture certain industry sectors, or sensitivity to interest rates, or arbitrage relationships, though in practice it is often not obvious how to link a latent factor derived through PCA to more traditional grouping structures. As discussed above, it is useful to think of the factor loadings in each principal component as weights in a ‘principal portfolio’. In fact, when (a transformation of) these weights are applied to the original security returns, we can produce the daily returns for each principal portfolio, just as we would for any other portfolio. If done properly, the variance of the principal portfolio will be in proportion to the standardized variance of that factor. For example, principal component 1 in our analysis of Dow 30 stocks explained about 45% of the standardized variance of the total portfolio, so that when we project the returns for principal portfolio 1 (see Figure 3. 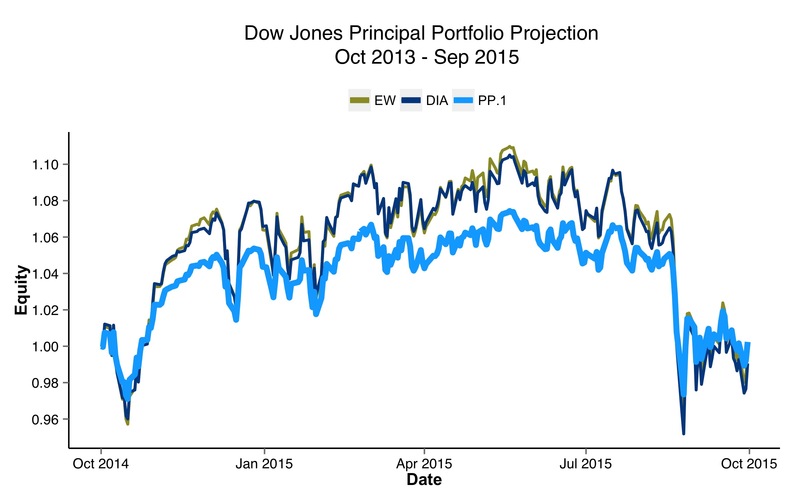 ), the returns have a variance that is 45% of the variance of the equal weight portfolio of Dow stocks. Since PCA factor portfolios (i.e. principal components) are definitionally independent sources of risk, we can use them to determine the number of independent bets. However, PCA yields a loadings matrix that contains the same number of factors as there are assets, so we are no further ahead. The goal is to identify how many factors capture a statistically significant portion of portfolio variance; only these factors represent true independent bets. Guttman (1954) and Kaiser (1960, 1970), asserted that in order to be significant, “a factor must account for at least as much variance as an individual variable” (Nunnally and Bernstein, 1994). According to the Kaiser-Guttman method, since the average of all standardized eigenvalues is 1, only factors with standardized eigenvalues greater than 1 can be considered to be significant. Note that in Figure 1 we have added a horizontal line at 1 demarcating the cutoff threshold for significance. From visual inspection it’s clear that just 3 factors exceed this threshold over the past year, so on this basis we might say that there are just 3 significant independent sources of risk at play in this asset universe over the time period analysed. Unfortunately, Horn (1965) observed that even randomly generated correlation matrices will present with what appear to be significant factors, according to the Kaiser-Guttman method, purely by chance. As such, they showed that the Kaiser-Guttman method systematically overestimates the number of significant factors, and proposed that factors should only be considered significant if they explain a greater proportion of variance than what might be expected from random chance. Figure 4. shows the same factor loadings for the Dow 30 as Figure 1., and a red line that describes the average variance for each factor derived from 3000 random correlation matrices of the same dimension as the sample matrix (and formed over a similar time period). Note that Component 1 substantially exceeds the threshold of what would be expected from random matrices. However, factors 2 through 30 fail to exceed the threshold, suggesting that these factors are not statistically significant. It follows that over the past 252 days the Dow Jones index of 30 stocks represents only 1 statistically significant independent bet. In other words, it has been almost impossible to achieve meaningful diversification from assembling active portfolios of Dow stocks. Figure 4. Standardized variance from Principal Component Analysis of Dow Jones Industrial Average (blue bars), and from random correlation matrixes (red line) from Oct 2014 – Sep 2015. Now that we have a general understanding of how to interpret the results of PCA in the context of portfolio analysis, we can proceed to the core of our investigation. Specifically, in the next few articles we will examine the sources of independent risk in larger, more diverse portfolios of stocks, and determine how much of this risk is captured by a much smaller universe of global asset classes. Perhaps surprisingly, we will show how a relatively small universe of global asset classes contains the majority of independent bets available across global markets. Importantly, we will link this fact back to Grinold’s Fundamental Law of Active Management to show why active asset allocation may dominate active security selection in the pursuit of better investment performance. Figure 5. uses vector diagrams to illustrate how the directional forces from two assets, when held in a portfolio, combine to influence the overall volatility of the portfolio, as a function of the correlation between the assets. Consider a portfolio with one half unit of asset a, with volatility , and one half unit of asset b, with volatility . The portfolio volatility is the weighted sum of the volatilities of the individual assets in the direction of the volatility, and the direction of volatility between assets is captured by correlation. In 1.a we observe how the volatility forces combine in the portfolio when the assets are perfectly correlated ( ). Note that the two volatility vectors are moving in exactly the same direction, so that the portfolio volatility is simply the weighted sum of the individual volatilities: . In 1.b we observe how the volatility vectors combine when the assets have no correlation ( ). In this case, the assets move in completely unrelated directions, and the portfolio volatility is represented by the hypotenuse of a right-angled triangle. 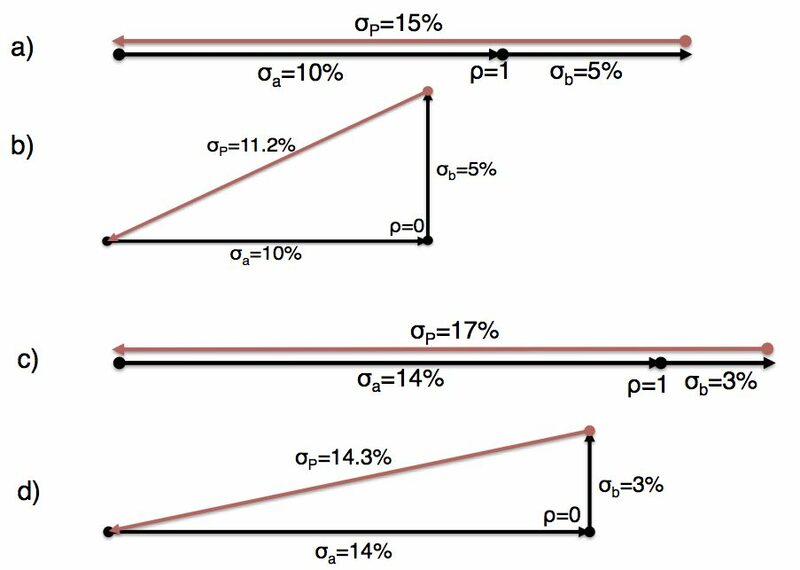 In fact, we can use the pythagorean theorem to solve for portfolio volatility: , so , which works out to 11.2% (note that other correlations will work as well, but require slightly more complicated trigonometry). Note that, when the volatility forces do not align in exactly the same direction, the volatility of the portfolio is less than the sum of the volatilities of the two constituent assets. Figure 1.c and 1.d demonstrate how a portfolio manager can scale exposure to assets in order to alter the risk profile of the portfolio. In this case he moves to 1.4 units of asset a and 0.6 units of asset b, and this substantially alters portfolio volatility. However, even as he actively scales exposure to assets, the correlation between the assets remains constant. As such, you can see why, when it comes to analyzing the independent bets in a portfolio, we should not be distracted by relative volatilities. Correlation is the only indelible feature, which is beyond the control of investors.